Healthcare Analytics is a product of business software and consultancy services. It basically uses the extensive data, statistics, qualitative information to explain phenomenon, predict model or solve the problem with effective decision making process. Today is the age of information where mostly decisions and program relies on information. Healthcare field is in the middle of information revolution where most of the decisions are now taking place with the extensive use of information and key associative soft-wares in this field. Healthcare organizations now rapidly deploying the information systems to improve both clinical care and business operations. Healthcare is the most sensitive area which is directly related to welfare of human being and their health. So, there is rapid growth and demand for accurate, timely and availability of useful information throughout the organization for different purposes in order to provide the best services to patients. Healthcare Analytics is the right choice to tackle such issues with bridging two different horizons at one place that are Healthcare system and analytical system of business intelligence. 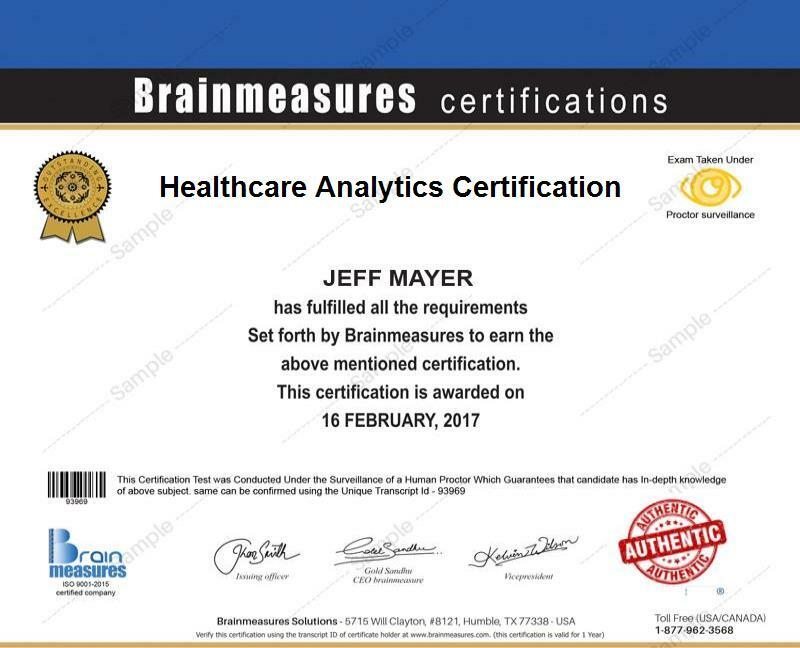 Being an expert in the field of Healthcare management with best practices of value addition and diagnosis the disease through the help of best available information in precise form through Healthcare Analytics philosophy is now possible with the existence of Brainmeasures which is now offering such unique certification among its many offers. This course is available at Brainmeasures is developed in such an understandable manner so you will no longer find it hard to master all the essential concepts and strategies related to the field. The type of knowledge and expertise of business and information management applications in Healthcare and medical industry that you can get from this certification course is developed in such a way that you will no longer have a hard time understanding all the strategies that you can use when it comes to improving the level of efficiency, when operating with Healthcare services especially the factors that are associated to management and patients’ satisfaction. With the help of the Healthcare Analytics certification course offered by Brainmeasures, you will no longer find it hard to master everything about business intelligence and information management concept as well as its applications in health sciences. After successfully passing a comprehensive exam (which is the part of certification program in order to hone your knowledge and expertise), you will be recognized as a certified Healthcare Analytics expert who is capable of implementing the process without dealing with any difficulties. Earning your Healthcare Analytics certification is also extremely useful for you especially if you dream of receiving an even higher salary or to increase your ways of earnings. You can use your Healthcare Analytics certification and earn at least $88,000 annually. You may go beyond this earnings and earn up-to $130,000 or more that is based on your prior education, experience and expertise in the efficient use of business intelligence soft-wares and information management techniques in Healthcare profession. Getting enrollment in the Healthcare Analytics certification program offered by Brainmeasures is extremely beneficial to numerous individuals considering the fact that it is effective in honing their skills and knowledge in the field of Analytical and business intelligence implementation in Healthcare. You can expect this certification program to work more suitably for Healthcare managers, Healthcare operations managers, medical officers, database managers, software engineers, data analysts, ERP specialists, doctors, nurses, staff of hospitals, Healthcare supply chain members and professionals in the operations and services of Healthcare and its management with the aim to enhance their understanding about the Analytics and taking advantage of it in achieving best quality services and Healthcare remedies with in-depth knowledge about Healthcare management.